This one-bedroom apartment features a living room with fireplace, a fully equipped kitchen and a west-facing patio garden. It comes with a TV, a bathroom with free toiletries, hairdryer, bathtub or shower and a washing machine and clothes dryer. In Edinburgh, West End Twelve Holiday Lets features self-catering accommodation, just a 10-minute walk from Stockbridge, the New Town and West End districts. It has a garden with barbecue facilities and a west-facing patio. The one-bedroom apartment offers a west-facing, fully enclosed patio, a lounge with TV, feature fireplace and a fully equipped kitchen. The bathroom comes with free toiletries and a hairdryer, and there is also a washing machine. Guests will find a range of restaurants, pubs and shops on George and Princes Street, less than 1 mile away. They can also explore the cosmopolitan Stockbridge district with its fashionable bars, delis and boutiques, 10 minutes’ walk away. The Royal Botanic Gardens and Inverleith Park are a 7-minute walk away and the Scottish National Gallery is over 1 mile away. Edinburgh Railway Station is 1.6 miles away, while Edinburgh International Airport is located 6.9 miles away. Guests are requested to let the property know their arrival time at least 15 minutes prior to arrival by phone. A security deposit of GBP 50 is required before arrival for incidentals. This deposit is fully refundable upon check-out and subject to an inspection of the accommodation. Early check in and late check out is possible for an additional fee of GBP 10 per hour, subject to availability and by prior arrangement. Late check in is possible for an additional fee of GBP 20, subject to availability and by prior arrangement. Guests are required to show a photo identification and credit card upon check-in. Please note that all Special Requests are subject to availability and additional charges may apply. Please inform West End Twelve Holiday Apartment in advance of your expected arrival time. You can use the Special Requests box when booking, or contact the property directly with the contact details provided in your confirmation. Peaceful garden apartment with private patio in a great location. Lovely private patio and garden area in great location. Very peaceful and comfortable. Wifi would have been great but we were made aware of this before our stay. Stockbridge is a really nice part of Edinburgh. Close to town, but still a very low-key and relaxed atmosphere. The apartment is spacey and has basically everything you need. It's really nice to have your own kitchen. The hostess was kind and helpful, but it would have been very helpful to have some information on paper too as she told us everything quickly and then left. The bathroom could have been cleaner and there were no extra bedsheets or towels, which when you stay for almost a week gets kind of...icky. And even though there's a washing machine it's hard to dry sheets in the Edinburgh climate. Parking is 1.80 per hour nearby, there is no parking space and no free parking. There was no toilet paper in the flat. No wifi and phone signal very poor. Upstairs flat makes considerable noise in the evening. Many tv channels don't work properly. Very cosy apartment in a super location. It wouldn't take much to make it better. There were lots of nice touches. Great location near to both West End and Stockbridge. Sunny outside space. Pretty parlour with windows on 3 sides. It would have been good to have wifi, although we were aware that this was not provided and it only caused us minor issues. Good location, low standard of housekeeping. Good location only £5-£7 to get into city and Stockbridge has loads of quality pubs and restaurants. Easy parking. The place needs a good clean. Cobwebs in the living room and the fridge was dirty. The garden is overgrown and you cant even get through the gate without getting soaked if its been raining. The toiletries that were in the bathrooom were open and half full. 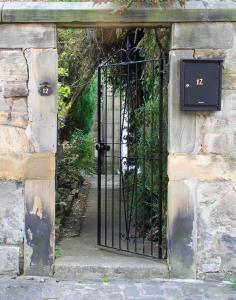 This is a great place to stay in a fabulous neighborhood (Stockbridge) of Edinburgh. The apartment is compact but quite manageable for two people. It would be helpful to have a binder with instructions on how the various appliances work and other useful information (local restaurants, unique shops, events, taxi numbers, etc.) most hotels and B&Bs provide. We felt the lack of wifi. This place was the last on our trip and we had gotten quite used to having it in our accommodations throughout Ireland and Scotland. Though coffee shops abound in the Stockbridge neighborhood, we found out some did not have wifi. We recommend this lodging for its excellent location. Those who may best appreciate it may be restricted to a more forgiving clientele as some things are not always in the best repair. It is really nice to be able to use the little yard when it isn't raining. Access to public transport is good and buses go frequently. Shops are in walking distance. had a nice stay. will come back again. the bed very clean and comfy. so was the rest of the flat. Un lugar estupendo para descansar después de visitar la ciudad. We had an enjoyable stay in the Ferguson Apartment. The accommodation was clean and comfortable. Pretty views from windows but still convenient for the city. Brian was very helpful and friendly. What a splendid apartment!! !We stayed at the Ferguson apartment, a 2 bedroom apartment on the 1st floor, 2 adults and 3 kids, ages 8, 12 and 16. The apartment comes with a twin bedroom and a master bedroom. The extra bedroom was placed in the living room, but we moved it to our huge bedroom, for the benefit of the young child.The rooms are spacious. The double bedroom has en-suite and is huge.This apartment is beautiful, spacious, full of light, quiet, has a great location, equipped to our needs with some extra pampering like juice in the fridge, jam and bread etc. and wine for the grown ups.It was very clean and tastefully decorated. Gas operated fire in both the master bedroom and the living room.Fantastic hospitality by Brian.Highly recommended.Within a 10 mins walk to Princes street with the kids.Bus stops just below, yet a very quiet apartment.About 20 mins drive to the airport.2 remarks: Don't plan on sitting on the wifi too long, and make sure you get how the water heating system works. Set 1.4 miles from Edinburgh Castle, these upscale apartments in a Victorian townhouse are also 1.8 miles from the Royal Mile. Offering period features such as original fireplaces, the 5 polished apartments also have free Wi-Fi, flat-screen TVs and DVD players, along with full kitchens. Some have bay windows and views of Dean Street. The property offers free parking and access to a shared garden.